Just back from one of the Costas. 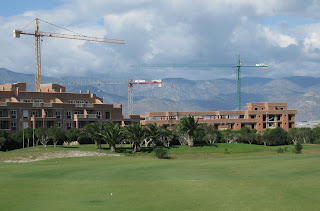 Where in Andalusia alone there are meant to be 1.2m unsold flats, with another 1m+ in construction. That’s a lot of flats. 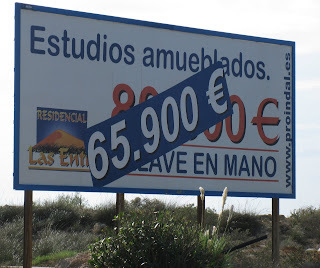 The Coast of Spain is a poster child for excess development. But talking to people, the economic situation and the general level of confidence seems no where near as bad as the UK. So why does Gordon Brown persist in saying the UK is better positioned to handle the economic situation than other countries? First, I suppose he daren’t admit the truth. Second, and in some ways even more worryingly, he may believe his own hype. But looking at Spain as an example: their banks are not in such a mess because their Central Bank was responsible for stability and imposed sensible balance sheet constraints. Consequently, households are not as indebted (Household debt as % of disposable income:110% vs 174% in the UK). And their Government debt is also less. As Brown was saying how well the UK is positioned, sterling’s exchange rate against the dollar especially, but also all other major currencies, fell sharply. There is no better indicator of the rest of the world’s view than this. - Delayed reaction in terms of cutting interest rates and providing bank liquidity. You’ve got to be positive; exchange rates are volatile, and there is more than one reason for the dollar’s rise. And a decline in sterling should help the economy, at the cost of more inflation. But Brown’s errors of judgement are slowly being exposed. George Osborne has got into a mess, and he has damaged his party as well. - The only detailed analysis I have seen comparing his statement with Nat Rothschild’s suggested Osborne was broadly in the right, and that Rothschild had had to amend his earlier insinuations: the discussions were initiated by Rothschild. I suspect Osborne went along with it out of politeness and an understandable curiosity to see a mega yacht. - Mandelson’s involvement seems a lot murkier and so far is being swept under the carpet. - Getting out of his depth in this way has allowed the heat to be taken off Mandelson and has provided evidence for the theory that “they are all as bad as each other”. - He was not having a good “credit crunch” He has not provided any serious ideas or comments since initially not knowing what to do about Northern Rock. Keeping quiet and letting Labour mess it up is a reasonable strategy for a bit – but not if you don’t keep quiet! So he should probably go, however unfair, although possibly to another role. This would let someone credible like Clark or Davis come back – or Hague? The trouble is it would be a Labour scalp but if done, it’s best done soon as part of a reshuffle. Then the focus can get back to Mandelson's behaviour. And hopefully it will prompt the Tories to take a serious look at their money raising activities. I've just been in Venice, at a conference of stockbrokers and investment managers. As you do, when financial markets are collapsing. As one speaker said, where else would you go but a sinking city? - The current selling is by people having to sell to get cash: equities are the easiest thing to sell. Plus some are starting to panic. This will eventually stop. Those who need cash or who panic will have sold all they can. - The problems are starting to be understood, Governments are moving from talking and pontificating to actually doing something. - Lastly, Asian growth could still be strong. The short term problems aren't share markets - it doesn't really matter if they fall for a bit. It's that the banks are in a mess, by having lent too much. And this stops money moving. An accounting joke from the conference: Banks' balance sheets have two sides, liabilities on the left and assets on the right. The trouble with banks is that on the left, there's nothing right, and on the right, there's nothing left. An accounting joke is very suitable for Venice. Venice's main claim to fame is that it is the birthplace of double entry bookkeeping. Some people go on about the mercantile empire, the exploration, the Carnival, the romaticism and perhaps most of all the timeless beauty. But to be the foundation of accounting: now there's a real legacy. Interesting comment in the Sunday Times today by Lord Owen concerning the "mood music" growing about an Isreali strike on Iran. It's also clear some Republicans are getting very concerned that Obama will win the election. Previously a crisis would tend to support voices of experience, the sitting administration, perhaps even the more experienced candidate. But Obama has done well out of the financial crisis. It couldn't be could it that voices in the current administration want to create a geopolitical crisis so that McCain's foreign policy experience would come through? (And remember limited wars tend to get economies moving again.) A serious middle east escalation on top of the current financial situation would be really depressing but somehow I wouldn't put it past some just to stop Obama winning. When the story of local Councils being big losers from depositing money with Icesave, the failed Icelandic bank, I felt the inevitability of Northumberland County Council being involved. And sure enough it was - not the biggest loser, but in the top 5, with £23m. £23m! This is a Council with a substantial deficit bequeathed by the old Labour and Council leadership, with the predicted savings from having a unitary council unliklely to materialise. You would have hoped the new leadership would have wanted to review the figures and assets. Its been common knowledge and talk that Icelandic banks were seriously overstretched and the leadership has had 4 months to do something about it. I'm sure the excuses will come; interest rates were good; the bank was FSA approved; other Councils lost money as well. But in the end I guess its simple incompetence. Its not their money; they just don't care. I bet no-one takes responsibility for this potential loss - that I think will be key to whether or not the Lib Dems are serious about Government. Vince Cable sounds like a serious financial leader - although a close comparison of his words suggests he's a bit flaky - but will his party here in Northumberland accept responsibility for this error?